On Tuesday, November 21st at 7:30 p.m., there will be sung a Solemn Traditional Latin Mass for the feast of the Presentation of the Blessed Virgin Mary at the Pontifical Sanctuary of Our Lady of Mount Carmel in East Harlem, New York. The sermon and readings from the pulpit will be in Spanish. 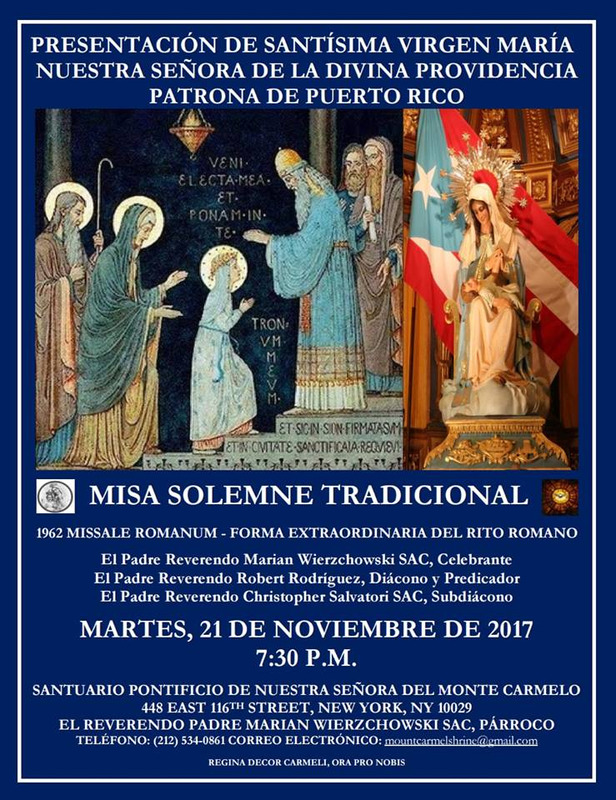 After Mass there will be devotions to Our Lady of Divine Providence, Patroness of Puerto Rico, whose feast falls on November 19th. The Puerto Rican community has a long and deep history in East Harlem, and is of course praying especially for the island in the wake of the terrible damage from hurricane Maria last month. The shrine is located at 448 East 116th Street.